My first ever bread i tried at home was a No knead bread, yes no knead bread is definitely an easy method of baking a bread at home if you are novice baker. No knead bread goes for easy preparation, just take all the ingredients in a bowl, mix it and keep in warm place, once the dough double the volume, transfer it to a mould, let it rise again and bake. 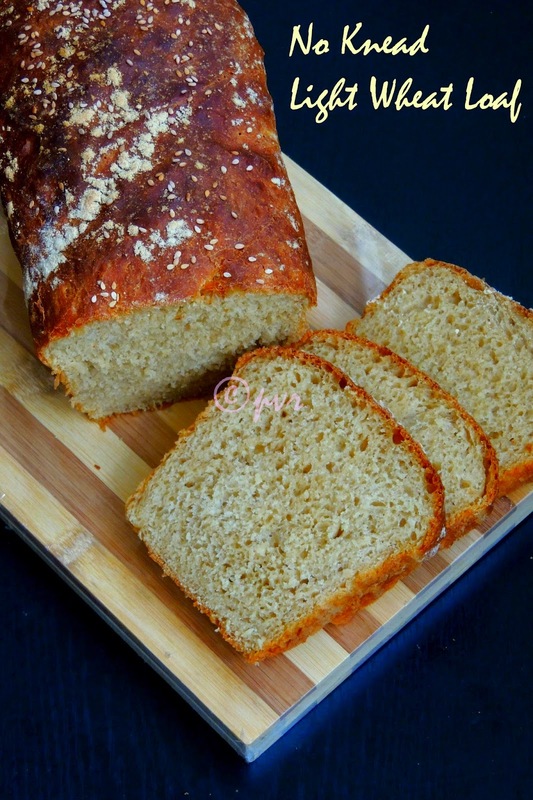 How easy na, coming to today's bread, this is my first post of this week's blogging marathon, as i chosed Tame the yeast as theme, this theme starts from this month and Valli want to keep this theme every month as she wanted us to overcome the fear of working with yeast. Two members of the group will share their tried and tasted bread with us and we have to prepare at home those suggested breads and post it in our blog during a week of blogging marathon. I baked two breads suggested by the members and prepared a sandwich with this light wheat loaf as per the rules of this theme. This bread was suggested by Varada, an enthusiastic baker who never failed to amaze us with her wonderful bread.Check out the Blogging Marathon page for the other Blogging Marathoners doing BM#43. Take the flours in a large bowl, add in the sugar,salt,yeast, pour in the water and oil. Grease your palm and spread over the top, cover it with plastic wrap and keep in a warm place overnite. Sprinkle whole wheat flour on the top, cover it again with a plastic wrap, let it sit in a warm place for an hour or until the dough rise a quarter of an inch over the side of the pan. Let the loaf sit in the pan for few minutes. Transfer it to a wire rack and let it cool completely. Dont slice until its completely cooled. This was my first bread loaf too and I was very impressed with myself:).. yours has come out very good too. wow it looks so soft and spongy :) surprising that its made with no kneading done :) looks fantastic aks !! The bread has come out so well Priya..Mine rose very high..the taste was good.. The bread looks fantastic, Priya. All purpose is a type of wheat flour..I wonder what is 'wheat flour' you used? Wholewheat flour? Nice and soft wheat loaf. Home made breads are always so healthy and flavourful. The bread has come out perfect.. Delicious ..
Priya super bread I have book marked it.kneading is therapeutic but sometimes I feel my arms might come out:))ideal for such days.. Thanks for the recipe. A prefect loaf nice and soft. 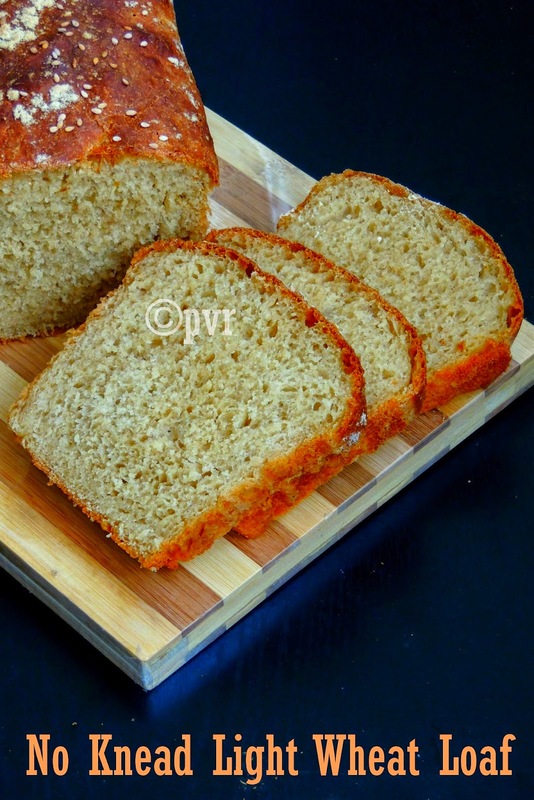 SO soft and spongy bread, will have to try this out soon. Does your measurements make 1 loaf or 2 loaves? So porous! Definitely bookmarking this one. I too feel that a good home made bread tastes lot better than the store bought one. Your bread has come out fantastic. 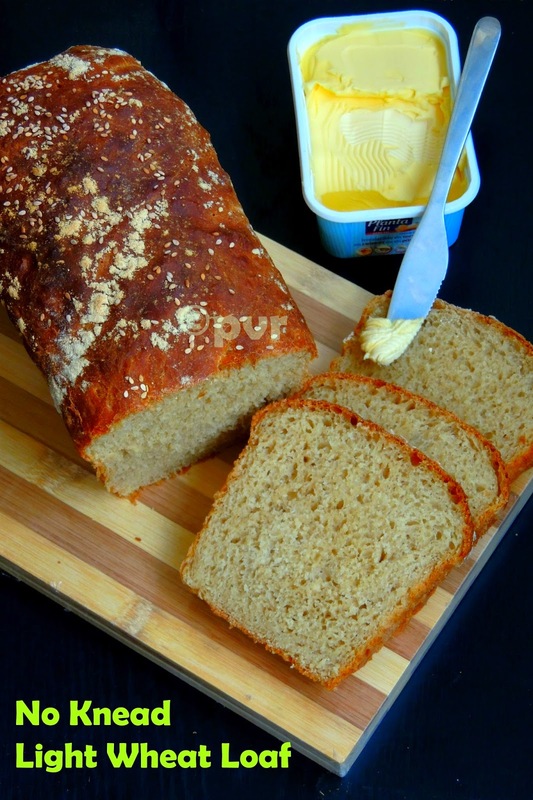 Just saw Mireille's recipe for this bread, u guys are pushing me to try this bread this weekend itself. :) Lovely clicks Priya! I tried baking this bread, but it somehow didn't cook from the middle, what could have gone wrong? I even tried baking it for 15-20 mins more, but still it didn't cook. Plz help. @Harshe, did u preheated your oven for 15minutes?? wat type of mould u used for making this bread, i'll advice a metal,glass or silicon mould for making bread.Personally i think this might be happened when the oven is not preheated enough or else coz of the type of the mould, coz this bread came out fabulous to everyone who ever tried till now. Hope this helps. This is my favorite no-knead bread till date. Your slices look so soft and fluffy. That loaf of bread looks awesome! And thanks for the sweet words. Very porous and fluffy loaf, Priya! A soft and porous bread. We loved it too!Looks good!